Talking to Rafe and Rob a bit got me back into thinking about the Thonian Empire. IMC, I made Cirkhosia one of the 10 provinces of the Thonian Empire. The recent discoveries of various versions of the Great Kindgom Map has made me rethink some of the ideas I have for the Thonian Empire, but lets just say I am working to adapt to multiple interpretations of the world map for this. 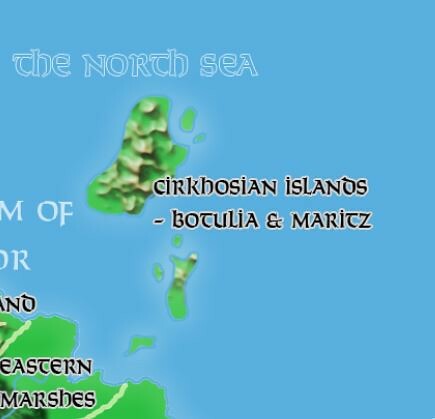 Aldarron made Cirkhosia a separate country, quite far away from both Blackmoor and Thonia. While this is a totally fair interpretation, my take is going to be rather different. Aldarron also has Salik as a city within Cirkhosia, while in my campaign, Salik is one of the Provinces of Thonia, on the border of the Desert Realm. What is known about Cirkhosia from published material? Not much. From DA1 know that Cirkhosians have traders, some of whom have made it to the Skandaharian lands. This makes me think that they have to be excellent sailors and merchants. The new Great Kingdom maps revealed new locations such as the Kingdom of Botulia and the Duchy of Maritz. While nothing is known about these realms AFAIK, it is speculated that in Greyhawk, they later became turned into the Lendore Isles or the Sea Princes. In my campaign, Greyhawk specific things do not exist, but proto-Greyhawk concepts will be found. Since the Provinces in my take are made up of 2-3 duchies each, I decided to revise Botulia and turn it into a Duchy. Both Botulia and Maritz are now part of Cirkhosia as shown on the map above. Beyond this we have very litte. I'm thinking about borrowing some ideas from the Lendore Isles and the Sea Provinces of Greyhawk, but my GH fu is fairly sparse. In any case, I prefer slight nods over ripping off things completely. I'd also like to tie this into Blackmoor specific lore about Ships and Merchants in general. I wonder if Nichols the Merchant would have contacts in Cirkhosia. Skandaharians might later have raided these coasts, once they became aware of the existence of these islands. Captain Castagere (DA4) might have visited. Perhaps his ship was constructed in the Cirkhosian Shipyards? The FFC story about the attack of Sea Monsters might work well here. Perhaps lore about Sar-Aigu and those sea monsters from the D20 Blackmoor sourcebook could have some influence here? In Threshold issue 20 I supposed Circkosia was inhabiteb by Jennite related people (http://pandius.com/skthrpol.html) mostly because I think the name was created with assonance to the Circassians https://en.wikipedia.org/wiki/Circassians so it would be more a horse riding /traders / raiders culture, also because my placement was the one of your regional maps here http://pandius.com/bmregmap.html while the one above seems different. Are you going to be putting cities, towns and villages onto your map, when you finish reworking Thonia? You might want to take a look at Anna Meyer's map of the Flanaess for some inspiration. Her map is 3D, but forgetting that, she actually uses a lot of symbols that provide a lot of extra information. She includes roads (and road types) for example. She even put sea lanes onto her maps, out of the various ports of the Flanaess. Robert Conley made some "How to Build a Fantasy Sandbox" tutorials. (And then expanded the early ones but not all of them.) He had an interesting system of using a hex map to set down locations, monsters and other adventure opportunities. If you look at his stuff and have a think about it, you can make sure your new map of Thonia does not have any large "dead" areas, where nothing really happens. I don't know enough about Blackmoor to understand why some people might think of Cirkhosia as a separate country and other people might think of it as province of Thonia, but I do know that there are some real-world places that have internal politics about independence...and even some regions of one country that are claimed as part of another country. I think that even some areas of modern-day USA have had people talking about independence fairly recently. Perhaps there could be some sort of Ben Kenobi solution that takes that sort of idea and does something with it. Could Cirkhosia be a former kingdom that was taken over by Thonia? Could Cirkhosia be a colony of Thonia with semi-autonomous rule? Could Cirkhosia be a region of Thonia with a movement to break away? Could Cirkhosia be a former city-state that joined with Thonia for mutual military protection? One of these options, or something else that you come up with, is probably going to give you some good adventure hooks. I've moved Cirkhosia because of the paragraph in DA1 suggesting that contact between Cirkhosian merchants and the Skandaharians is rare even if existent. The association to Circassians is an interesting idea. I will have to look into that! Much more detailed maps are in the works. This is just an overview map. So towns etc will be appearing later. Incorporating Maritz and Botulia from Gary Gygax' Great Kingdom map will at least provide us with some location names even if we have no idea what these realms were about or whether Dave Arneson actually used them back when he was using the Great Kingdom map. Anna Meyer is amazing. I can't hope to match her quality, but she is great for inspiration for sure. Mapping is just a side project for me though. My main project is developing the region. My starting point is this. We know that The Thonian Empire has Ten Provinces. However, we do not know the names of the provinces. So I have searched through the DA modules, the FFC and other writings by Dave Arneson to find geographical names that we don't know all that much about and mapped them with the provinces. Each province is made up of 2-3 duchies each (at least in my interpretation) so other names from those sources can be used to flesh out duchies, towns etc. I have also scoured all Blackmoor sources for noble families, organizations, races, gods etc so that we can give all of them homes across the Empire. Your suggestions for the possible scenarios of the history of the Province are useful. Thonia is an Empire based on conquest so both a history of being conquered and groups seeking independence are certainly possible. Talking to RobJN the other day, I realized that Thonia needs to be modelled not unlike Ravenloft or Midnight in that the rulers are evil. This is an oppressive empire and each province needs to reflect that. Blackmoor should be the only free Kingdom besides realms populated by barbarians or various decadent or equally tyrannical rulers. Anything else would undermine the idea that Blackmoor is unique within this world. The Sea Barons is the World of Greyhawk nation that best matches the geographic relationship between the Great Kingdom and Botulia and Maritz. The Hold of the Sea Princes is on the opposite side of the Flanaess, south of Keoland. Lendore Isle is on the right coast, but much further away. Andre Norton's novel Quag Keep describes a coin from Maritz, spelled "Maritiz" in that source ("two of the mother-of-pearl disks incised with the fierce head of a sea-serpent which came from the island Duchy of Maritiz."). In the Domesday Book the famed Pygmalion is associated with an island culture, so you might consider placing the High Hefner and the civilization of Trecht ah Cibrryhaeott in Botulia or one of the smaller islands nearby (though I think I'd make it a different archipelago to the west of Blackmoor's continent/Skothar, where Alphatia is now, since it was part of Tom Webster's Atlantis campaign). Thanks! This is where my Greyhawk fu comes too short. The similarity to the Sea Barons is uncanny though! That is a great idea! I had forgotten that Jon did that writeup of the Pygmalion and really didn't think about associating the island cultures of Webster's Campaign with this region. I groan at the High Hefner character, but puns were pretty much the standard for all of the characters back then. Any idea where the name Trecht ah Cibrryhaeott comes from? I have some different ideas for the Alphatia region of that era, but nothing is set in stone yet, so I might come around for that. Another problem with that region is that it is so far removed from both Blackmoor and Thonia. The similarity to the Sea Barons is uncanny though! Yeah, I think it's a safe bet that the islands of Botulia and Maritz on the Castle & Crusades Society Great Kingdom map became the Sea Barons (Asperd Isle and Fairisle) on the Darlene map. I groan at the High Hefner character, but puns were pretty much the standard for all of the characters back then. Yeah, but even Dave Arneson changed the names of his characters in different incarnations (so the Egg of Coot became the Ogg of Ott and the Gin of Kralc became the Gin of Salik). So it's very true to the source material to change the names as needed to make their puns less obvious. Any idea where the name Trecht ah Cibrryhaeott comes from? I'm drawing a blank on the last part of the name, but Trecht is probably a reference to Utrecht. Another problem with that region is that it is so far removed from both Blackmoor and Thonia. Yeah, placing Trecht on islands just east of northern Thonia means it's very conveniently placed for a Blackmoor campaign to interact with it. On the other hand, one reason I think I'm favoring putting it far to the west is so that "Salik" is in a region equivalent to the Baklunish lands in the Grayhawk setting. But the Gin doesn't have to be from the same region as the Pygmalion. This is actually a great suggestion! The name Cirkhosia always sounded very Robert E. Howardish to me. I agree, and his names often resunded ancient populations' names. Trecht is, I think, from Utrecht (which makes sense, since it's a religious center) and Cibrryhaeott is reasonably close to Cypriot (because it's an island?). In the Chthonic Age, the Cirkhosian isles were inhabited by exiled sahuagin tribes, the Sar-Aigu. Even after their rule gave way to dragons and giants on the mainland, the Sar-Aigu reigned on the islands for another two ages until humans invaded their shores. Legend has it they didn't wipe the Sar-Aigu out or drive them away, but instead interbred with them, giving rise to the Playdium, or gilled men, a race fierce enough even to defy the armada of Overking Robert I as he united the lands of Thonia into an empire. As a result, the archipelago of Cirkhosia were among the last to be conquered by the Thonians. The island of Maritz was conquered during the reign of Robert's successor, its capital of Bethage falling after three days of fighting. Botulia held out for 200 years longer, until control of the empire had shifted to the House of Centour and the emperor's greatest general, the ferocious Hasdribal, was dispatched to tame the northern island once and for all. Hasdribal, according to the imperial histories, led an army of sixty thousand men into the previously unvisited Botulian interior, slaughtering many of the Playdium inhabitants until he came to the hidden capital of the Playdium people, Cibrryhaeott. There, their high priest, known as the High Hewer, led the worship of the Pygmalion, a beautiful entity said to have been gifted to them by the gods themselves. After taking Cibrryhaeott following a lengthy siege, Hasdribal ordered the central temple torn down and all the priests and priestesses slain. Knowing their deaths were near, the priests and priestesses gathered their sacred books, scrolls, relics, and treasures into the Chamber of the Ages and put the Pygmalion into an enchanted sleep. Yet even as the last priestesses were slaughtered by the invaders, the power and presence of the dreaming Pygmalion blasted the minds of the invaders and dissuaded Hasdribal from disturbing her. They withdrew, burying the relics and the Pygmalion with them. From the rubble of the temple, Hasdribal ordered the construction of a fort, Traiectum (later known as Trecht). The Thonian soldiers who had participated in the conquest were granted lands, and Thonian peasants and craftsmen were brought to the island to serve them. The Playdium race became absorbed into the Thonian settlers, their fish-pale skins and gills only appearing rarely thereafter. Centuries passed. Trecht was burned down by Skandaharian raiders and not rebuilt. The ruins of Cibrryhaeott were forgotten. Nearly 800 years after the crowning of Overking Robert, Lo-Ren was a humble Botulian peasant of distant Playdium ancestry. Alone of his family, he was blessed and cursed with gills and fish-pale skin. Driven to rediscover the secrets of his forebears, he gathered five disciples and ventured into the ruins of Trecht ah Cibrryhaeott. There, they descended into the old temple, performing the rituals of opening until the Chamber of the Ages was laid open. Then, as had happened to the Thonian invaders centuries before, the minds of the invaders were overwhelmed by the presence of the Pygmalion. Only Lo-Ren and his newest disciple, the Gin of Salik, withstood the Pygmalion's power, and they quickly closed the doors in order to prevent it from affecting the others. There, Lo-Ren and the Gin of Salik translated the ancient Playdium scrolls and tomes and unriddled the spells that would release the Pygmalion from her slumber. With the Pygmalion awakened, Lo-Ren and the Gin of Salik spread her message throughout the land. A new priesthood was formed to worship her, and soon the island of Botulia once again embraced her as its state religion. As the years rolled by, a rivalry developed between the priesthood, Lo-Ren, and the Gin, each convinced they alone deserved to have the Pygmalion. During the celebration of the rites of the new year, the Pygmalion commanded Lo-Ren and the Gin to permit the leadership of the priesthood access to the Chamber of the Ages, so that she could share her joy with them. Lo-Ren reluctantly agreed, but this was too much for the Gin, who cast a spell of command upon the Pygmalion and smuggled her out in an earthen jar. Escaping on his flying carpet, the Gin and his prisoner disappeared from sight in the fog of the North Sea. Lo-Ren ordered all available ships pursue him, and he was not seen again for a hundred years. A century later, Lo-Ren reappeared in Botulia, the sole survivor of his expedition. He remembered little of the intervening decades. He said he had caught up with the Gin of Salik and, in a fury, cast him into the ocean. The Gin, with the power of the Pygmalion under his command, would have dealt Lo-Ren a death blow, except that the Pygmalion freed herself from his spell, distracting the Gin... what happened after that, Lo-Ren knew nothing. With the Pygmalion still missing, Lo-Ren was declared the new High Hewer. All believed the Pygmalion and the Gin of Salik were forever lost at sea. Militarily, Botulia has chosen no sides in Uther's war of independence. With the Afridhi invadion far to the west, and Mohacs many hundreds of miles away, the High Hewer could decide that the threats posed by Skandaharian raiders were a greater priority to the people of the isles. Recently, Drumilcar, the ruler of Maritz, sent an emissary with news from overseas. According to records discovered in the University of Blackmoor, a battle took place 200 years ago in the shadow of a mountain hideaway that the records claimed belonged to none other than the Gin of Salik. Lo-Ren recognized the details of the battle, and a description of a combatant that could only be himself. Today, the quest for the lost Pygmalion has begun anew. Lo-Ren has dispatched his best agents to investigate rumors of the Gin and his hideaway, as well as offering a standing bounty for any independent parties that might find the Gin or the Pygmalion and return to Botulia what they had lost.